As I write this just after dark on April 2, exactly 146-years ago Robert E. Lee’s men began to pull out of their Petersburg lines and head toward the bridges to cross the Appomattox River and escape from Petersburg. Their sad trek would end a week later at Appomattox Court House. The fact that they made it to Appomattox was a miracle thanks in part to the incredible stand made by a handful of Confederates at a small earthen bastion named Fort Gregg. 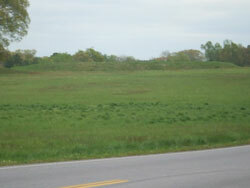 This spot stood, and still stands to this day, just west of Petersburg. Interstate 85 passes about 100 yards north of the fort. Travelers on I-81 take exit 63-A (U.S. 1 south). Turn on Simpson Road (rt. 142) and go past State Police building. You will now be on the Boydton Plank Road. Make next left turn toward Central State Hospital and then turn right into gravel parking lot. Fort Gregg stands about 300 yards to the east. Make the short walk across the field toward the earthen parapet. As you make this walk imagine you are a Union infantryman in the 89th or 158th New York Infantry Regiments. You have stood for about two hours [right about where you parked your car] and watched the two brigades of Thomas Osborn and George Dandy slam against the fort’s steep walls. They are pinned down and now your brigade, commanded by Harrison Fairchild, receives orders to charge the fort. The enemy rifle and canister fire has littered the ground with blue uniformed bodies and you have to jump over them as you hustle ahead. You are in no-man’s land and you have to move forward, but when you near the fort’s walls you find a water-filled moat clogged with other Federal soldiers trying to claw their way fifteen feet up the wall. Meanwhile, imagine being one of the 334 Confederates ordered by General Lee to hold Fort Gregg at all hazards. Lee needed the Fort Gregg garrison to hold back the blue wave as long as possible to give time for reinforcements to arrive from Richmond and fill in the inner Petersburg defense line a mile farther east. As you glance over the top of the wall you see sunlight glint off thousands of bayonets as the Union troops in John Gibbon’s 24th Corps maneuvered to attack your position. With no reinforcements and no more ammunition the mission was in doubt. Yet, the rebel garrison held out for more than two hours. The fort finally succumbed at about 3:15 p.m. to the pressure exerted by the 4,400 attackers from five Union brigades. With only three hours of daylight left and exhausted soldiers in the 24th and 6th Corps, Grant elected to resume the Petersburg offensive the following morning. The time purchased by the Fort Gregg garrison allowed the rest of Lee’s Army of Northern Virginia to escape from Petersburg that night, exactly 146 years ago. Only one Confederate escaped from Fort Gregg while the rest of the defenders were KIA, WIA and/or CIA. The combined casualties climbed to more than 1,200 men. In May 1865, fourteen Federal soldiers (mostly color-bearers) received the Congressional Medal of Honor for their heroism and bravery in the Fort Gregg assault. The immensity of the violence that took place at Fort Gregg amazed many of the veterans from both sides. Many of these men recorded their haunting experiences of this day until they passed away. Yet when they died the drama of Fort Gregg seemed to disappear with them. Visit Fort Gregg and find out more about why this spot is such hallowed ground. I am trying to find some additional information on an ancestor of mine that perished on April 2, 1865 “Planting the Regimental Colors on the parapet of Fort Gregg”. His name is Cpl. Joseph B. Simpson of C Company 158th NY Infantry and there is a monument to him in Jersey City New Jersey, quite an odd thing to do for a lowly Corporal unless you also know that James Howard of K Company 158th NY Infantry received the Congressional Medal of Honor for the same actions that very day, but lived until 1879. Howard must have been right next to Joseph that day when he fell. I see that there is a Simpson Road leading to Fort Gregg – is there any information on who that road is named for? I would be very interested to know if it is possible that naming this road was also done in honor of Joseph Simpson as well. Jeffrey, Thank you for your comment and question and I apologize for taking so long to respond to this post. We have had technical problems and I am just now seeing the comments that readers have posted here for the last year. The bravery of your ancestor, Joseph Simpson, is outlined on p. 148 of “The Confederate Alamo.” all the Medal of Honor recipients for heroism at Fort Gregg survived the battle. The numerous other Union color bearers who carried the flag until they were killed did not receive any recognition for their bravery and sacrifice. Until now, I did not make a connection between Corporal Simpson and the name of Simpson Road which is the western extension of the old Boydton Plank Road. I would imagine that the naming of the road is only a coincidence. John, Thank you very much for your response. Honestly I completely forgot about my questions to you, my wife came across it while she was doing research. She purchased your book and just gave it to me as an early birthday present… Wow, what a great present! I will definitely be reading the first hand accounts you cite! Jeffrey, I am glad you enjoyed the book and wish I had more info on Joseph Simpson and the naming of Simpson Road near Fort Gregg. If I ever come across anything more or I will let you know. If you find anything please let me know t0o.